This guide does not take the place of any Quickbooks tutorials. Users unfamiliar with Quickbooks should review the Quickbooks help guides. If you haven't used Quickbooks yet, we recommend you first install it and just dive right into it. The onscreen guides are very helpful. 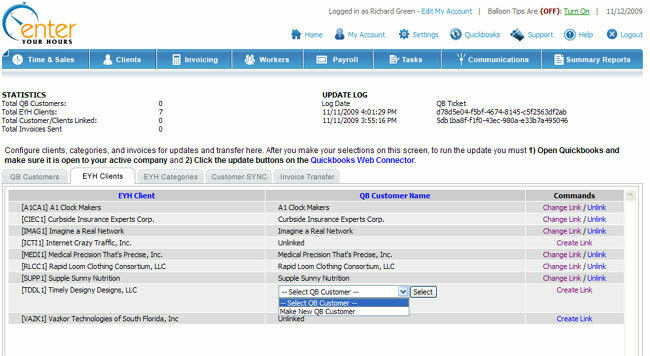 There are lots of ways to integrate EnterYourHours.com with Quickbooks. Below we'll walk through a few different scenarios. Your particular needs might not coincide exactly with any of these scenarios but you should be able to derive the knowledge you need from some combination of the scenarios. Before we dive in, it's probably a good idea to explain how the data in EnterYourHours.com lines up with the data in Quickbooks. In EnterYourHours.com, there are clients. For more information about how to manage your client list, see the Client List topic. These link to your Quickbooks Customers. Mapping EnterYourHours.com Clients to Quickbooks Customers is easy, as seen in the screenshot below. The other linkage is between EnterYourHours.com Billing Categories and Quickbooks Items. Here's where it gets a little tricky. This guide started off by saying it would take the place of any Quickbooks tutorial, and that holds true, but it would definitely be beneficial to discuss Quickbooks Items for the uninitiated. In Quickbooks, a Quickbooks Item can be many different entities. There are actually something like 11 types of items, ranging from inventory types items, to "other charge" items to service type items, etc. For example, a particular part, like a wheel axel can be a Quickbooks Item. It gets even more involved (and probably only interesting for accountants at this point) when you consider that each item maps to an accounting bucket, which are used on profit and loss reports. Most EnterYourHours.com users will be concerned with the Service type of Item. You might create an item in Quickbooks called Professional Fees, or Legal Services, or Consulting, or any term like these that correspond to the type of work you do. Some companies keep it simple, and have a single item for all of their services. Other companies like to track the different types of services more carefully and will create different items for the different service types. Where items really come into play is on Invoices. 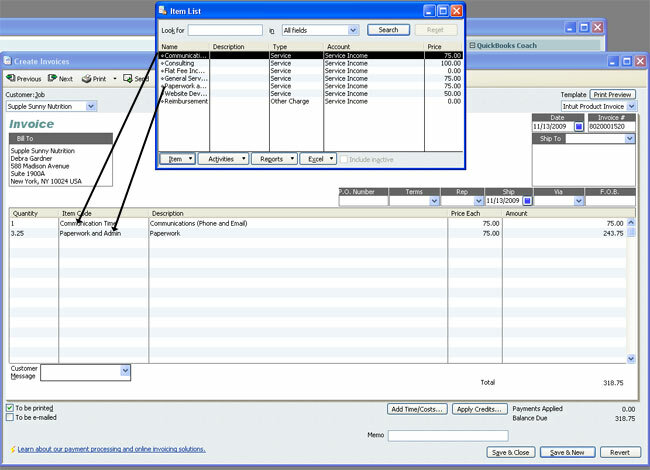 In Quickbooks, every line on an invoice is mapped to a Quickbooks Item, as demonstrated in the picture below. 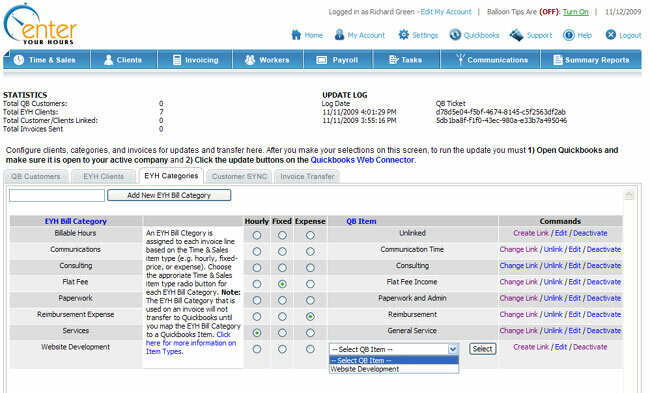 In truth, EnterYourHours.com Billing Categories have no other purpose in the system, except for mapping to Quickbooks, which is why in some places of the EnterYourHours.com system they are referred to as Quickbooks Categories, but in the Quickbooks Configuration area (see above screenshot) they are called EYH Billing Categories to differentiate them from the Quickbooks Items. For those EnterYourHours.com users that don't need to integrate to Quickbooks, default Billing Categories are assigned upon account creation, and from that point on can be ignored.